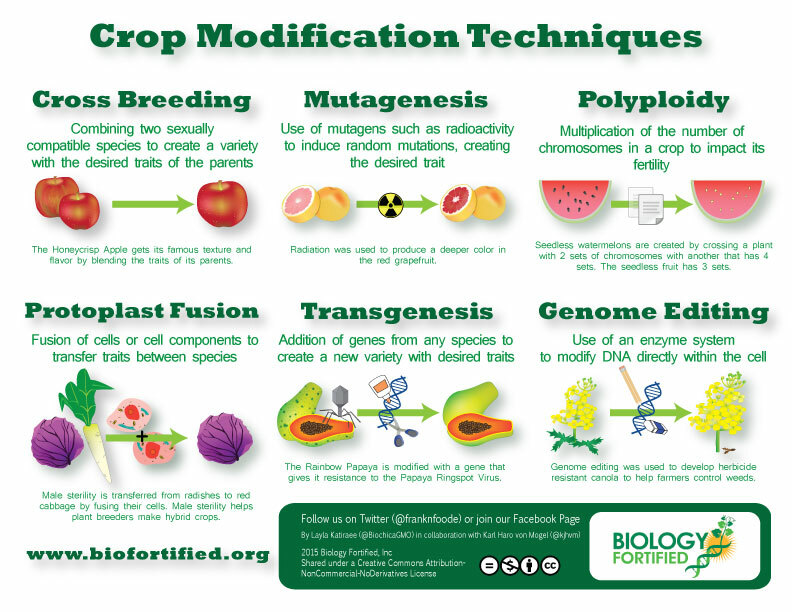 Crop Modification Techniques - Biology Fortified Inc.
To help educate people about the many methods that are used to generate new traits in plants, Biology Fortified has created an infographic on six different crop modification techniques, with examples of crops generated with each method. Scroll to the bottom of this page for download options. For millennia, traditional crossbreeding has been the backbone of improving the genetics of our crops. Typically, pollen from one plant is placed on the female part of the flower of another, leading to the production of seeds that are hybrids of the two parents. Then, plant breeders select the plants that have the beneficial traits they are looking for to go on to the next generation. Apple varieties such as the Honeycrisp apple were developed in this way – thousands of hybrid trees were made, grown, and tested to find just one great new variety with a combination of genes that has never existed before. 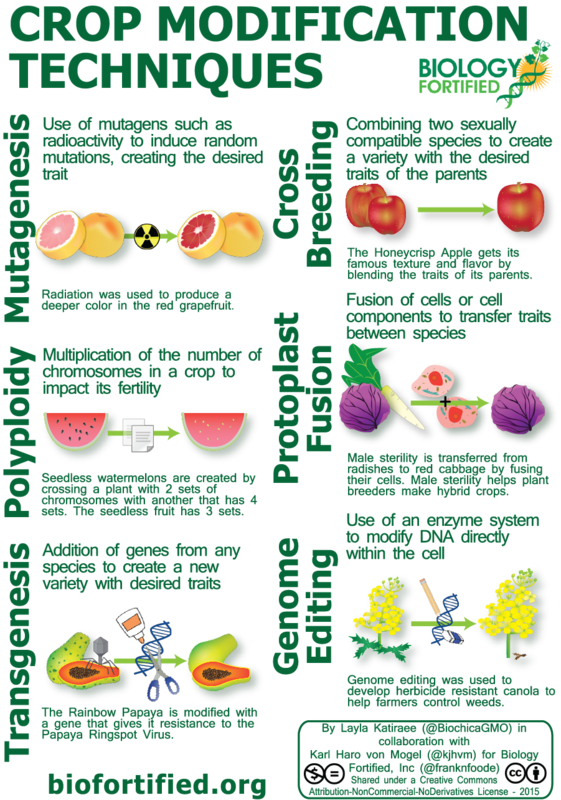 Modern plant breeding often uses genetic markers to speed the selection process, and may incorporate genes from wild varieties and closely-related species. Here are some videos about the different techniques that plant breeders use. Crossbreeding can only make use of desirable traits if they are in the same or closely-related species, so additional techniques have been developed to create new traits for plant breeders to use. In nature, new traits often arise through spontaneous mutations. 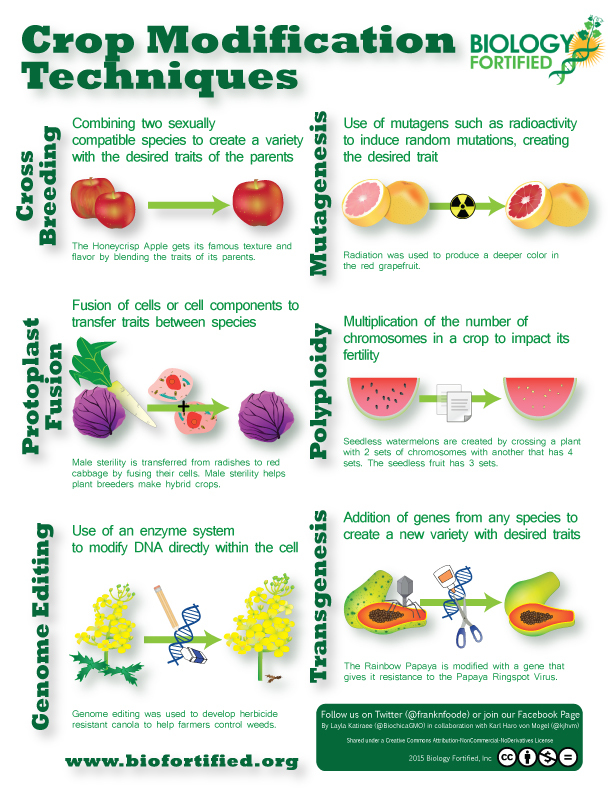 In the past century, this process has been mimicked by scientists, who have used mutating chemicals (such as ethyl methanesulfonate) or radioactivity to generate random mutations in plants, and subsequently screening for new or desired traits. For more information on mutagenesis, please view this post.The Ruby Red and the Star Ruby varieties of grapefruits were developed using ionizing radiation. The mutations that they carry give these fruit their characteristic deep red color. This article from the New York Times provides many additional examples of crops that have been developed using this technique. Most species have 2 sets of chromosomes: one set inherited from each parent. This is known as diploidy. Polyploidy is the occurrence of more than 2 sets of chromosomes. It can occur naturally, but polyploidy can also be induced through the use of chemicals. This crop modification technique is usually used to increase the size of fruits or to modify their fertility. For example, the seedless watermelon has 3 sets of chromosomes and is created by crossing a watermelon with 4 sets of chromosomes with another watermelon that has 2 sets, making a sterile watermelon with 3 sets of chromosomes, much to the delight of picnic lovers throughout the globe. Potato species also have many different number of chromosome copies, and potato breeders commonly have to change the copy number of their varieties to breed new traits into them (More on this process here). When sperm cells in pollen combine with the ova in the ovaries of a flower, this is a fusion of two cells into one. Protoplast fusion is an artificial version of this process. Beneficial traits can be moved from one species to another by fusing the protoplasts (‘naked’ cells without the cell walls that give plants their structure) together and growing a plant from the newly fused cell. One of the most commonly used traits that has been developed with this process is the transfer of male sterility between species. If you have a male sterile plant, you can more easily make hybrid seeds – especially for plants that have small flowers and are difficult to cross. Male sterility was introduced to red cabbage from daikon radishes, making it easier to produce hybrid seeds of this crop. Transgenesis is the process by which you introduce one or more genes into an organism from another organism entirely. This usually involves handling and modifying the DNA itself in a test tube, and then packaging it to insert it into the new organism. There are several ways to introduce the new gene or ‘transform’ a plant such as biolistics (the “gene gun”), using Agrobacterium – a naturally occurring organism that inserts DNA into plants, or by using electricity – a process called electroporation. Transgenic plants have been generated with many useful traits, some of which have been commercialized. For instance, papayas were transformed with a gene from the virus that infects the plant to make it resistant to the virus. Other traits include insect resistance, herbicide tolerance, and drought tolerance, and more. The creation of these ‘transgenic’ crops works even though the genes can from from any other species because the genetic language is universal to all life on this planet. Genes that originated from the same species can be called ‘cisgenic’ or ‘intragenic’. For more information, see this paper. Genome editing consists of using an enzyme system to change the DNA of a cell at a specified sequence. There are different systems that can be used for genome editing, the most promising of which is the CRISPR-Cas9 system (for more information on genome editing and how it works, please view this post). The sulfonylurea (SU) herbicide tolerant canola was developed to enable farmers to better control weeds and to enable crop rotation. The crop was created using a patented genome editing system known as Rapid Trait Development System (RTDS). You could conceivably edit the genome of any crop to alter any gene you wanted, from introducing new genes to restoring ‘natural’ alleles from the ancestors of our crops. Each of these methods have similarities and differences, and some work better for some traits rather than others. Each of them modifies the genetic makeup of the plant in order to combine useful traits together to improve agriculture. All of them have examples that are being grown on farms and are producing benefits, all can be patented in one way or another, and all of them can have unintended consequences. However, socially and politically the products of these methods are treated very differently. The fact that the changes that these techniques introduce do not line up with how they are treated when it comes to debates over the regulations for health and environmental safety, and political debates about labeling has come to be known as the “Frankenfood Paradox.” For instance, transgenesis produces far fewer changes and unintended consequences than mutagenesis (see this article), while mutagenesis is generally accepted and ignored in political discussions. Citation: Layla Katiraee, Karl Haro von Mogel. Crop Modification Techniques. Version 1.0. Biology Fortified, Inc. Jul 17, 2015.